Whenever I pick up fresh prawns from the market, I always reserve a few to crumb fry. There's hardly any prep involved and prawns cook really fast. So this is ideal for a weeknight as well. They turn out nice and tender and the crumb coat gives it a nice crunch. Really, nothing could be simpler. You should try this, you really should. Serve this alongside a nice fresh salad and some crusty bread and you're good to go. 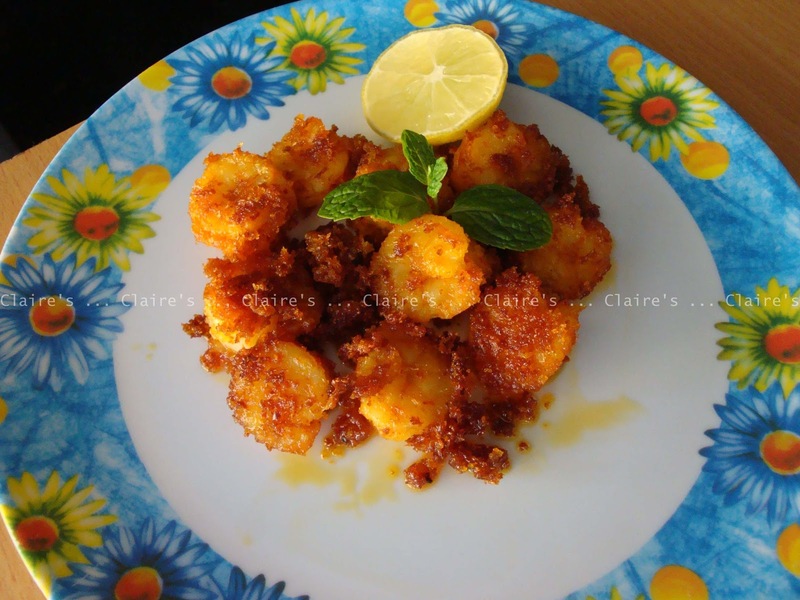 This is not so much a recipe but some guidelines that you can use to create this sea food delight. Feel free to tweak it to suit your taste. After resting the prawns in the marinade, dredge the prawns in the bread crumbs, making sure that each prawn is well coated with the bread crumbs. Heat the oil in a frying pan. Fry the prawns on a medium flame, adding more oil if needed. Watch the pan closely and don't allow the prawns to burn. Drain the prawns well and serve with a wedge of lime. (The lime wedge is optional.) All the little crumb pieces that fall away are really delicious too. I never throw them away. I simply add them to the serving plate. Remember, all the measures of the ingredients need to be adjusted to taste. So have fun and let me know how it goes! I bet this time in the marinade made all the difference in these prawns. The spices you used are excellent! OH MY HECK!!!! Absolutely heavenly!!!! I'm a seafood lover! I never think to buy prawns. This sounds so yummy. Thanks for linking up on Recipes I Can't Wait to Try! Be sure and come back this week to enter my giveaway!